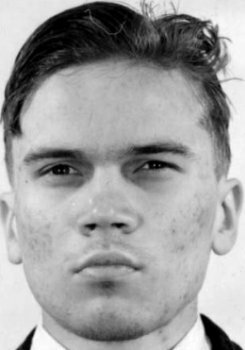 On this day in 1945, twenty-year-old Henry William Hagert died in Ohio’s electric chair for the murders of thirteen-year-old twins James and Charles Collins two years earlier. Hagert, who was only seventeen at the time of the crime, had shot the boys in cold blood and for no reason at all. The young murderer was from Lakewood, a suburb of Cleveland. He was a bit of a bad seed; those who knew him said he started to go bad when he was about seven years old, after a bout with double pneumonia and “brain fever.” After his recovery from the illness, he became unstable and aggressive. In 1942, after a high-speed police chase, he was arrested on multiple charges of auto theft and sent to the Boys’ Industrial School for a year. Typically, this experience in reform school failed to reform him, and he returned home worse than ever. John Stark Bellamy II, writing about him in the book The Killer in the Attic: and More True Tales of Crime and Disaster from Cleveland’s Past, noted that Hagert’s formal education stopped after his 1942 arrest, but he earned “a graduate degree in sexual perversion” from his stint in juvy. Just two days later, Hagert was driving his blue Chevy around when he picked up a nine-year-old boy, the son of a city aide. His plan had to been to sexually assault and murder the child, but he later claimed he was moved by the boy’s crying and pleas and decided to spare his life. This didn’t stop him from keeping his victim in the car overnight, torturing and sexually abusing him. The next day, Hagert drove the boy to a wooded area, tied him to a tree, and placed a series of anonymous calls to the child’s parents with clues as to his whereabouts. The police found the little boy where his abductor had left him. The following afternoon, for reasons best known to himself, Hagert returned to the spot where he’d left the abduction victim and encountered a Cleveland Plain Dealer reporter and a photographer. As Hagert made small talk with the photographer, the reporter became suspicious of his behavior and remembered the old cliché about the killer returning to the scene of his crime. He scribbled down a physical description of Hagert and took note of the license plate number on his Chevy. Later, he turned his notes over to the police. It’s pretty serious, you know. I kidnapped one kid and killed two others … I just felt like killing them, so I killed them. Now it all seems like a bad dream … I had the urge to kill before but I always managed to suppress it by running. I’d run down the street because I felt I had too much energy. The Collins boys were just victims of circumstance. I would have killed anyone at that time. It just happened to be them … I’m not especially sorry for any of those folks I have hurt … The whole thing is just like a smashed fender … When it’s done, it’s done — that’s all. While in custody he also confessed to a third murder, but this statement turned out to be a fabrication. An initial panel of three psychiatrists unanimously agreed that Hagert was insane. This would not do: the state could not risk the possibility that this incredibly dangerous psychopath would be committed to a hospital, only to escape later on, or be released like before, to walk the streets again. Five more psychiatrists were appointed to examine the defendant and this group said he was sane. In spite of this, the defense went with an insanity plea anyway. There wasn’t much of an alternative, given the evidence against their client. Testifying before the jury, one of the doctors described Hagert as “a petulant, cruel, ruthless, determined, egotistical young man with no respect for God, man or the Devil.” Another said Hagert had told him that, if he were set free, the first thing he would do was track down and kill the newspaper reporter whose tip had led to his arrest. The tearful testimony of his mother, who said Hagert had often complained of seeing “little midgets” who mocked him, carried little weight. Hagert’s conviction was overturned on a technicality in December 1944, but his second trial, held before a three-judge panel in March 1945, resulted in the same inevitable guilty verdict. Hagert himself didn’t seem to care much. His last words were, “Do a good job of it now. Give me a good dose — it’s good for what ails for me.” He did donate his corneas, possibly the only contribution he ever made to society.